Surprise your sweet mermaid this holiday season with our Mermaidens Gift Set in Malibu Pink! She’ll adore this special bundle featuring an entertaining lineup of mermaid things! 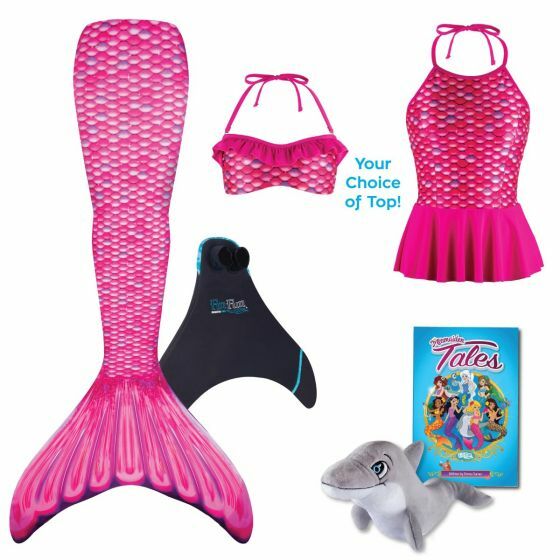 Make holiday memories brighter with a mermaid tail bundle for girls from the Mermaidens collection! Our gorgeous Malibu Pink design in youth sizes features hot pink and purple bubble-shaped scales that flow from tail top to fluke like the waves in the Pacific Ocean. She’ll delight in mermaid swimming with her new mermaid tail and monofin that comes with a matching swim top—and she’ll even discover things she can do out of the water (like read adventures about life as mermaid royalty) in our Mermaiden Tales book, while cuddling up to her FinFriend Bubbles the Dolphin.